One of the first facilities of its kind, the UCLA Molecular Diagnostics Laboratories has pioneered applications of diagnostic DNA-based testing for a wide variety of genetic and neoplastic diseases as well as DNA fingerprint analysis. 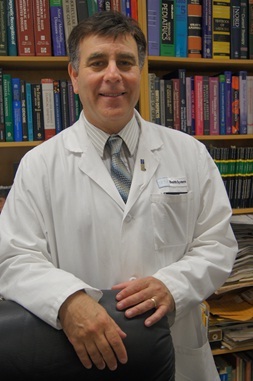 In addition, the laboratory has emerged as a leader in the development of quality assurance and ethical guidelines for molecular genetic testing..
Operating under the direction of Wayne Grody, MD, PhD, one of the primary authors of the College of American pathologists Inspection Checklist, the lab's role is not limited to clinical service and includes activity in basic and applied clinical research. Some of the innovations emanating from the lab include the first documentation of HIV infection of the heart in AIDS, development of a highly sensitive method for detection of cell-specific gene expression and micrometastatic tumor cells, population genetic studies of the allele frequencies of the clotting factor V-Leiden mutation, and CCR-5 polymorphism of HIV resistance and early diagnosis of pancreatic carcinoma. . The facility offers a host of testing including differentiation of donor from recipient cells after a bone marrow or organ transplant by DNA polymorphisms; detection of Philadelphia chromosome and other translocations in leukemias and lymphomas; detection of clonal immunoglobulin and T-cell receptor gene rearrangements in lymphomas and leukemias; identification of mutations in cystic fibrosis, Fragile X syndrome, familial breast/ovarian cancer (BRCA1/2 genes), hereditary thrombophilias, Huntington disease and other genetic disorders; oncogene mutation analysis in solid tumors as companion diagnostics for targeted molecular therapies; determination of paternity, twin zygosity and surgical specimen identity by DNA fingerprinting.. Recently, the lab was the site of a Human Genome Project funded pilot study on population screening for cystic fibrosis mutations, which led to the recommendation that all couples nation-wide be offered such screening.. Consistent with its cutting-edge tradition, the laboratory is working with Stanley Nelson, MD, of the Department of Human Genetics, as well as members of the Department of Pediatrics, embarking on whole genome analysis for diagnosis and discovery of inherited disorders and acquired mutations in tumors. The project will build on the lab's strengths and reflect a unique mix of state-of-the-art molecular diagnostics with expert clinical interpretation of the data produced. With plans in place to make this powerful new technology available to selected patients unable to obtain a precise diagnosis using standard genetic testing approaches, the Molecular Diagnostics Laboratories has established itself among the preeminent facilities of its kind globally.